Ramón Julián Puigblanque, also known as Ramonet (i.e. “Little Ramon” in Catalan), is an amazing but possibly underrepresented climber. To be honest, though, his job is to climb hard routes, both on rock and in competitions and he does it exceptionally well. One could say that he likes his ascents to do the talking, but you’d be wrong in thinking that Ramon doesn’t like a chat. ¡Hola Ramón! This year you have won a couple of World Cup events, the World Games and you came second at the European Championships. Are you happy with the season? The season started really well, I was very motivated and the results were coming, at least for the other competitions, the World Cup was a bit irregular. Starting from South Korea, which went badly for me, the motivation dipped a bit. Valence didn’t go well either. At this point of the season I have climbed a bit more on rock to cheer myself up, and it’s working : ) But in general it’s been a good season. With your victory at the World Games (the international four-yearly event for sports not contested in the Olympic Games), you have now won every regular international lead competition at least once. Was this an objective you had specifically in mind? Yes, the World Games were the one objective that was really important. It went really well, I climbed well and I was really happy about it. I felt quite pressured, because I knew that if I hadn’t won, I would have had to wait four years more. And yes, it was the only title I was missing and it was great to get it. You have also won the Rock Master for the 7th time this year, an incredible, record-breaking achievement. What do you like about this competition? What makes you perform so well all the time? It’s a competition I feel I can always perform well at, the setting is genious, the audience is very pleasant, they really push you forward. The whole frame in which the Rock Master is placed is really fantastic for me, I like Italy a lot. The final route, which we are allowed to try, works well for me. I wouldn’t say that I necessarily like it more than a flash final, but it works well for me. Sometimes it could be that I have a chance to find a beta for movements that I wouldn’t be able to figure out as well while climbing on-sight. In the same way, route-setters put more complex sequences that you can’t normally find in on-sight comps and that makes the final a bit more like climbing outside. Your career is now extremely long. 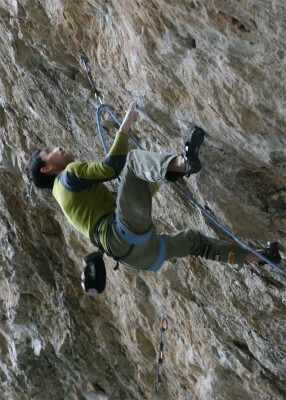 Many competition climbers retire in their late 20s, but you are over 30 and you are still going strong. How does that work for you? I keep on competing because I feel strong, I feel like I can do it. I can still be above or at the level of the strongest athletes. And of course because I like it, too. I really don’t feel much older than others. Of course I am, but physically I feel like somebody in his 20s. Looking at the bigger picture, though, what has changed for you compared to 6 or 7 years ago? Many things come into play. For sure the style of the routes has changed much. Competitors are also much stronger, the routes are harder. The whole “level” has moved on. Through my career, I have seen that earlier on competitions were simpler, these days they are harder to read and more demanding physically. Personally speaking, the more time passes the more I have experience, that’s definitely an advantage after so many competitions. If sometimes I can’t have the edge physically, I can have it mentally. But experience gives you pressure too, in a way. I’ve been at the top for many years and the pressure coming from people can be a lot at times: mistakes can always happen, to anyone. Given that you have been on the circuit for so long, are there friends and rivals that you miss now? For sure. In my team, I miss Patxi, I miss Edu. I have my coach, Toni Roy, but otherwise I have less company than before. It was easier to have fun before, with more team mates around. Speaking of people outside of Spain, somebody I used to get along with very well was Fabio Crespi from Italy. But I guess that if you have been competing for a very long time, most of the people you have started with will have retired after a while and I miss a bit everybody in that sense. We have read that you believe climbing should deserve a little more space among sports. What do you think could help to increase its visibility? We have to admit that climbing is a minority sport. Even in Spain, it’s not very known compared to other sports. It seems to struggle to really make an impact in the media. For example, in Catalonia, to speak about my local case, televisions from there could come to cover some events, to encourage people to take up climbing. Something like this would help. Changing subject a bit, what can you tell us about your training? I organise the training for the season based on the competitions that I want to do. So I look at those and then I plan accordingly. But sometimes I also plan or re-plan as things are moving forward. 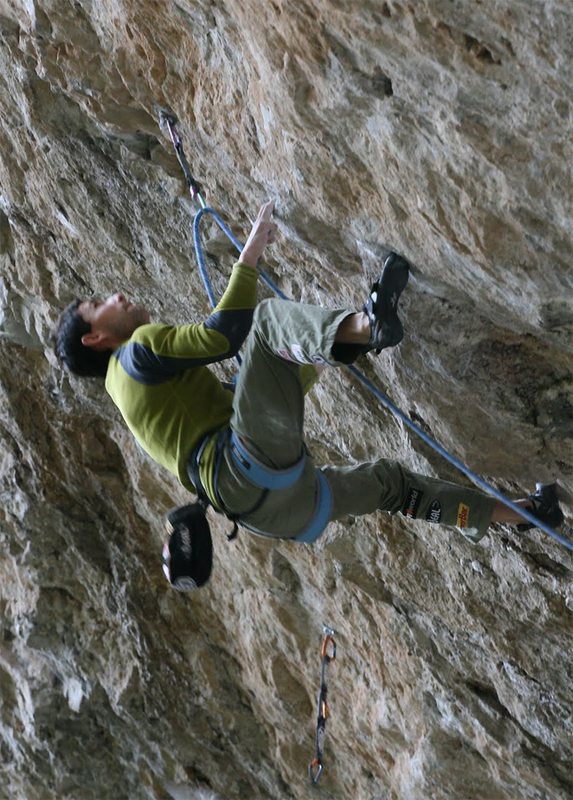 Do you prefer to train endurance climbing with a rope or doing boulder circuits? I would prefer to climb with the rope. But I live in a small town and we just have one boulder wall. So I train endurance without a rope. Naturally, I would love to have a better facility. I can go to Barcelona to do routes, but that’s an hour’s drive so it’s not ideal. All in all I manage to train rope climbing indoors with a rope one or two times a month but in the weekends I tend to go outdoors on rock, with rope. How do you prevent overuse injuries? Do you do compensation, stretching etc? I tend to stretch in order to avoid injuries. I’m not one of those very flexible people, so I know I have to do it. But when I’m in the mood, I just get carried away with climbing and then I end up training flexibility separately. When I warm up before I start climbing, though, I would do some stretching. And for your fingers of steel? Do you do any mental training? Nothing too specific. When I go cragging, I try to climb on-sight as much as possible, it’s always a bit of a challenge mentally, so that helps. But apart from this, I don’t have any specific mental training. You participate in the the opening of many climbing gyms. Is there something you have seen at these events that should become a standard for new structures? Not really, because many of the new gyms in Spain are aimed at people who are approaching climbing. They are not too big or the type of gyms in which you could host international competitions. In the best ones, we can host events for the Spanish Cup. Usually Top30 (the leading wall manufacturer in Spain) works really well and the structures they build specifically for the national events are the best you can find. But when you work on a new climbing gym and you make an inauguration, it’s more aimed toward people who want to start climbing. 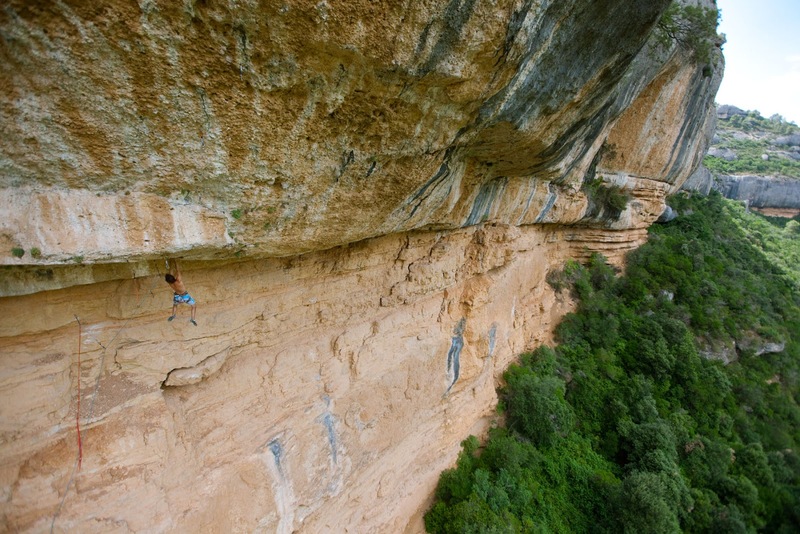 Spain has had many strong competition climbers, but you have also a great culture and history of rock climbing. What’s the relationship between these two aspects? 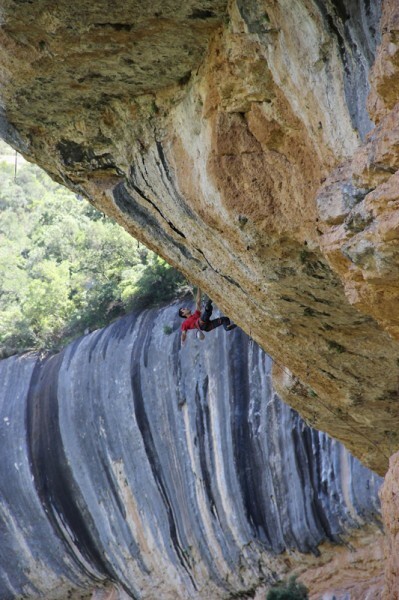 Spain is one of the best countries to climb, the weather tends to be good, Catalunya has loads of rock. This has made it an interesting place for climbers coming from all around the world. Great climbers have emerged also thanks to the fact that really strong climbers, like Dani Andrada, have opened so many hard routes. All this helped to have high levels of climbing and strong climbers. But the problem is that, given this, it’s hard to have indoors structures on par with what we have outside. 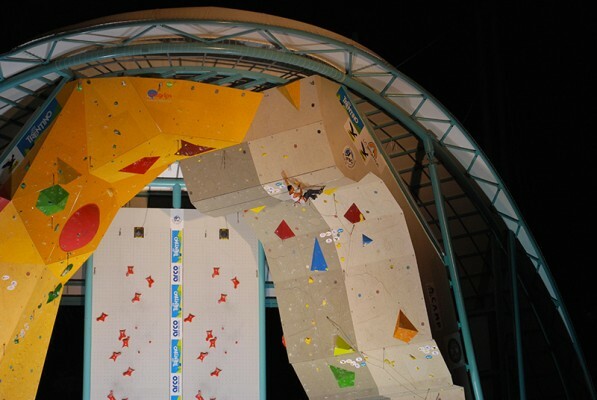 For example, in Austria they have really impressive structures for indoor climbing, but it’s not the same in Spain. It’s a weak spot of Spain, it’s hard to train as well as some other international athletes can. Is it difficult to leave the competition mindset at the end of the season and switch to the mindset you need for projecting hard routes? Personally I don’t have many problems, I can feel strong in the comps and at the same time I’d feel strong outdoors. Sure, if I have been focusing on competitions for a while and then go outdoors, it’s a bit odd at the beginning, but after 3-4 routes I am ok. Among your latest ascents on rock, which ones are those that you liked the most? Lately, I would say a route that has given me a lot of satisfaction was Red Ram, in Montserrat. The place is really big, but it was great to make a first ascent of the first route of 9th grade, it’s the first of that grade there. It’s a place with many routes and a lot of tradition, but not many people come to try really hard routes. But I really liked this one! I find boulders very brief, I don’t get the same feeling of struggle and commitment of a route of 40 metres. I like to boulder, but I don’t get the same satisfaction as on routes. Have you ever thought of taking a year or a few months off competitions to focus completely on rock? At the moment no, because I feel like I’m still strong enough for competitions. Should the results not come with competitions, it might be that I’d like to take a year to have specific objectives on rock. In the case, where would you like to go? Probably the same places I’m going to go now that the competition season ends. My objective will be to do a 9b. I’ve been climbing 9a+ for a few years now and I feel like it’s time to break the barrier. I have enough routes to choose from, I just need to go for them! 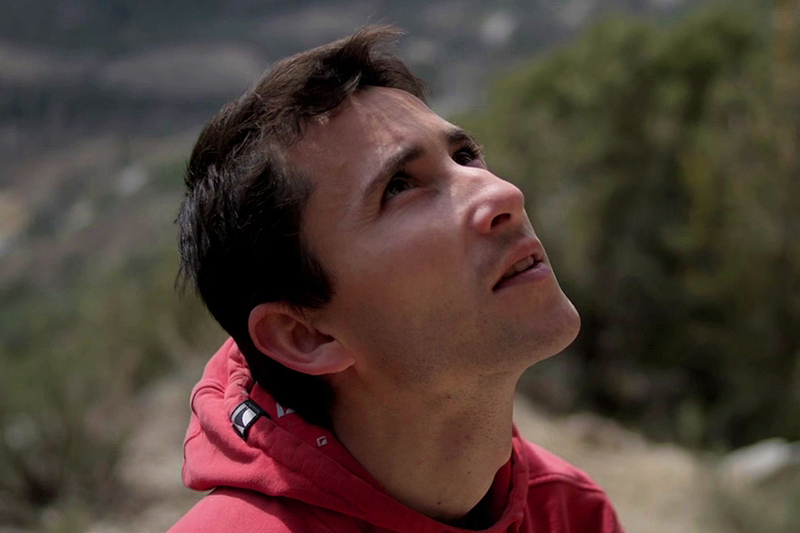 Ramón is sponsored by Tenaya, Top30, techROCK, Entre-Prises, TrangoWorld, PowerBar and ClimbSkin. Thanks again to Ramonet and his coach Toni Roy for the interview!